Trent Collins hits for the cycle in run rule win over Covington. 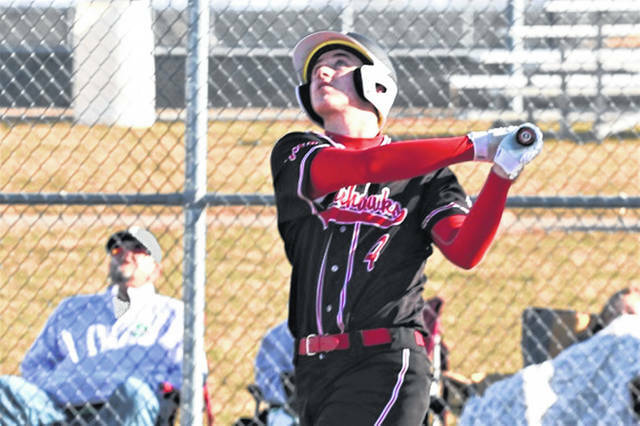 UNION CITY – The Mississinawa Valley Blackhawks run ruled the Covington Buccaneers 14-3 outhitting the Buccs 10-3 in a Cross County Conference matchup to go 2-0 on the season. After tossing a Tuesday night 14-0 run rule no-hitter against the Bethel Bees, MV senior Trent Collins followed by hitting for the cycle while knocking in eight runs in Thursday night’s win over Covington. The Buccs took an early 3-2 lead after one inning of play in what would prove to be the only runs the visitor would score on the day. The Blackhawks added three runs in the third and five runs in the fourth to lead 10-3 with four innings in the book. Mississinawa continued its torrid hitting plating 4-runs in the bottom of the fifth to giving the home team an impressive 11 run win. Collins paced the Hawks at the plate going 4-4 with a single, double, triple and homerun hitting for the cycle while picking up 8-RBIs and 2-runs scored. “Trent Collins had a stellar offensive night at the plate hitting for the cycle and 8 RBI which included a 3 run homer,” Guillozet said. Zac Longfellow went 3-3 with a RBI and 4-runs, Cameron Shimp was 1-2 with 4-RBIs and 4-runs scored, Kyler Guillozet went 1-3 with an RBI and Max Dirmeyer was 1-1 with a run scored. https://www.dailyadvocate.com/wp-content/uploads/sites/34/2019/04/web1_8-inches-Trent-Collins-cycle.jpgTrent Collins hits for the cycle in run rule win over Covington.